One of my earliest recollections of doing homework was walking by my grandparent’s farm creek with my father to collect clay. We mixed it with hay, also from the farm, and shaped it as an example of adobe (“mudbrick”) bricks. Even today, over half of the world’s citizens live in structures that utilize clay in their construction. We live with and in clay in many different forms. When the brick maker, potter or clay printmaker works with clay, they are touching and molding history, ages in the making. Over long stretches of time, rocks (often feldspar, the most abundant mineral group on our planet) are broken down chemically through natural solvents such as carbonic acid. Other clay minerals are formed through processes such as hydrothermal action: moving water under heat, sometimes via volcanos. The resting places for the clays are often near slow moving water areas such as lakes and basins; various amounts of water combine with the clay materials, creating its plasticity. When dried naturally or with the addition of heat to speed up the process, water levels decrease and the clay hardens. Clay has found essential uses over time, with its properties after drying coming in handy in creating ceramic vessels and both purposeful and decorative items. Human-created pottery shards have been found with origins as far back as 14,000 BC. Ceramic objects found in the Czech Republic date to 29,000-25,000 BC. Clay slabs were put into use as our first mediums for writing, with a reed-based stylus inscribing the clay. Small balls of clay served as early ammunition. It continues to be used by some for the medicinal treatment of diarrhea. Many now think of pottery and ceramic uses when hearing the word clay. We know these uses, as stated above, go back thousands of years. Decoration of these objects also started quite early, with paint being added as early as the prehistoric times. Early Chinese porcelain included decorative carving, and texture and color were both modified by adding sand or metal oxides. These techniques, as well as transferring a design to the pottery or the use of clay slips (essentially clay with a high moisture content, often with added colorants) continue in the much more recent art form referred to as clay monoprints. Mitch Lyons had a unique combination of backgrounds that was most likely necessary for the introduction of the art. His graphics degree and printmaking experience met with his art and ceramic degree elsewhere. He noticed that while working on decorating pottery works he created, he could transfer a design he made elsewhere to the pottery via paper; a small amount of colored clay would stick to the paper, and would display the design. He rightly surmised that if he experimented with various papers, he might eventually come up with materials that would hold on to enough clay to make an art work in itself, without the need to further transfer it to a clay vessel. The clay bonds to the paper via an electric charge present in the clay. As such, some materials will “hold on” to the charged clay to a higher degree than others. While many traditional papers did not attract and hold the clay, Mr. Lyons found some newer man-made materials that did work, including reemay, used in filters, and pellon, typically used as a fabric interface material. 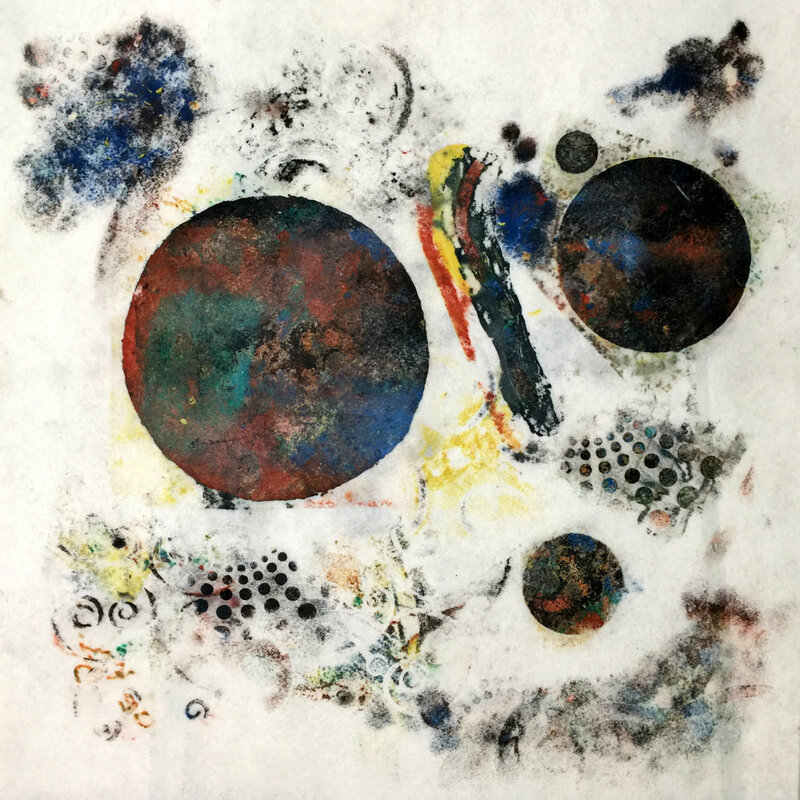 The clay monoprint artist works on a slab of traditional high temperature stoneware clay and adds or manipulates additional clay in various forms. Initial Clay Slab or "Matrix"
The most common addition is through the use of (typically colored) clay slips. A slip is a mixture of clay with additional water, creating a texture between heavy cream and oatmeal in density. (Tile #6) Kaolin or China clay is used. These slips are mixed with universal colorants to create various hues and tones, as the artist wishes. The artist often starts by "painting" the entirety of the clay, known as the matrix, with one or more shades of colored slip. From there, numerous techniques are used. A common approach is to paint abstractly on a sheet of blank newsprint with slip, allowing it to dry slightly. This paper can then be placed slip-side down on the matrix, with the clay slip transferred to the matrix via the use of a pastry roller. Variations can be used, such as painting specific, concrete shapes on the newsprint, and/or placing a stencil or textured item between the newsprint and matrix before rolling. One can also paint directly on the matrix, although this can provide a bit too much water content, if the artist is not careful. If the artist is using characters like numbers or letters where direction is important, he or she must realize that printmaking reverses the image on the print, so some advanced planning use is necessary. At times during the process, when water content seems high, or after a good bit of work, a blank sheet of newsprint is placed over the matrix and rolled lightly to reduce moisture and better bind the layers of clay. When the artist is ready to print, the area for printing is masked with drywall tape, whose adhesive is only light, yet stay in place. The matrix and the receiving material (substrate) are misted lightly with a spray bottle, and the substrate is placed on the matrix. The pastry roller is worked back and forth over the substrate, particularly working at the edges and corners for a clean transfer of clay. 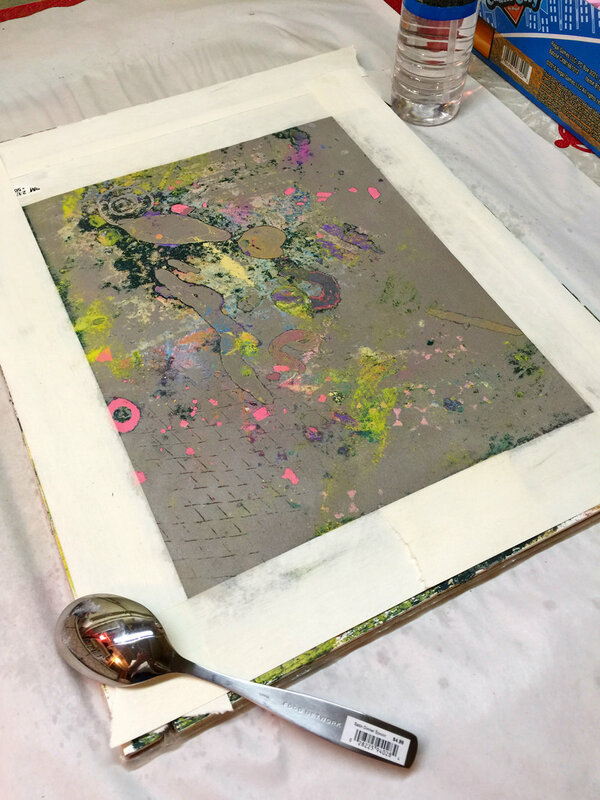 A finishing process occurs by rubbing the bowl of a large spoon over the print, carefully lifting an edge or corner on occasion to check for the quality of transfer. The completed print is carefully pulled from the matrix and hung to air dry before spraying with a clear water sealant. The matrix is ready for another print, with yet more clay! View several monoprints below, and visit the clay monoprint page for many more by using the menu above or clicking here.